As a consumer of products, I am a stickler when I purchase items over a certain amount. I want quality, I want a good price, and I want to know that the company will stand behind the product they sell me. I rarely, if ever, have purchased the latest and greatest thing because, unless it offers something so incredible and I just can’t resist, I usually look at last year’s model. It will typically have tested metrics, it has reviews by many users, and if updateable – fixes and updates provided by the manufacturer. And more often than not, it’s much cheaper because a premium is generally charged for the newest features. I have typically dealt with software purchases and adoption using this same approach, and rarely come across something that falls into the “must have” category. So why am I boring you with how I purchase things? I’m doing it to outline the fact that I am not the guy that needs the latest shiny thing or the “jump on the bandwagon” type of individual. That being said, I’ve recently found a “must have”, and that is Power BI. Power BI has been like a shot of adrenaline to mainstream BI for me. It has revved up the creative juices to a whole new level, and I love talking about and using this product. I enjoy finding new applications for it, and using it to guide clients to fast and deep insights into their business. And they like that too. Today is the two month mark since Power BI’s GA release. I think it’s only appropriate to re-cap some solid facts behind why this is one of those “must have’s” for companies. Visually, it is appealing. The interface is easy to use and the drag and drop functionality is quick, seamless, and allows the report user to try out many different visuals to find just the right way to present their data. The tool has built in capabilities to handle modeling and sharing, and is flexible enough to be able to adapt to the many different ways businesses want to implement a BI solution. This tool supports not only the IT report users who build reports and display to end users, but it gives the end user the same abilities to create their own reports and share, on top of, receiving those same IT created reports. And good bye excuses, you want to see that report I made while we’re out of the office? Just pull out your mobile device and bring it up on the Power BI App. The Pro license is 9.99 per month, or about 120 a year per user. Comparing that price to a similar BI offering like IBM’s Watson Analytics at $30 or $80 per user per month ($360/960 yearly) and Power BI is a lot more palatable. Both the Power BI Desktop and the Service have direct built in ability to report issues, or send feedback. There is a dedicated support site to help all types of users find what they need. Users can submit a ticket to resolve a specific problem (for free users as well). A Knowledge Base, tutorials, feedback and feature request, and a growing community of users to ask and answer questions. Check it out here. There are some current features that I consider trade-offs for what I’m getting. I’d love to see administrative tools for larger implementations, more options for use and integration (SSRS, Power Point, SharePoint or external web pages), full support of SSAS cubes and multidimensional, and full control over presentation and layout formatting. One of the main reasons that pushed me past all of my initial skepticism about this product, was the almost frenetic pace of features and updates that were and still are being poured out. 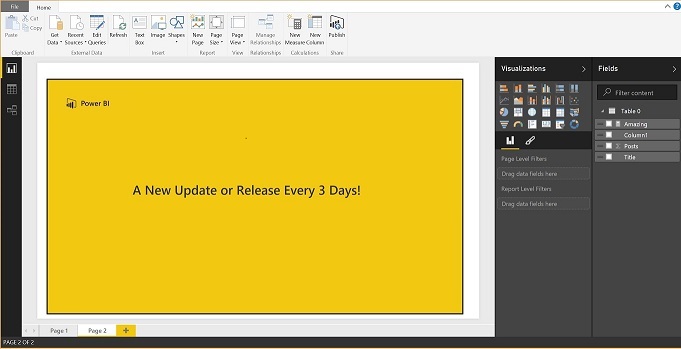 If you take a look at the Power BI blog site, this is where the team announces all the latest and greatest releases for the Service, Desktop and Mobile. You will find that the blogs in the last two months since the GA encompasses the following. If you haven’t picked up on the reason all of the above is exciting and compelling, I’ll spell it out. Microsoft is branching out with Power BI into an entirely different model of service, support, and results. All driven, in large part, by the community of users. The rate at which the Power BI team is producing new features on an already useful and compelling BI tool should excite anyone. And the price goes beyond the confines of a ridiculously good deal. This is not yet the perfect BI tool, and it still has some holes to fill to fit every BI need. However, after seeing how dedicated Microsoft is to this tool, and how engaged the Power BI team is, I’m putting my money down here. I’m choosing the tool that gives me quality, is a good deal, and comes from a company that supports their product. Power BI is that tool.